Learning means change and transformation. 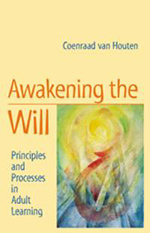 But in order to learn, argues Coenraad van Houten, we must first awaken our will. True adult education, he says, enables our spiritual ego to accomplish this. He describes the forms in which learning can be meaningfully structured, and offers advice and ideas to help overcome specific learning blockages. The book regards the business of adult education as a full profession, and it provides a theoretical and practical basis for its true task: an awakening of the will. COENRAAD VAN HOUTEN was born in the Netherlands. After studying Chemistry, Economics and 'Social Pedagogy', he lived and worked in Indonesia, Hong Kong and Britain as a manager in business, as a consultant, and as the director of the Centre for Social Development (which he co-founded). He has developed specialist programmes and seminars on adult education, 'destiny learning' and the path of spiritual research, and presently advises organizations on training programmes. He is the author of two books and the co-founder of the New Adult Learning Movement.